Plasma BT uses advanced atmospheric pressure plasma technology to deliver a wide range of bespoke treatments. Plasma BT Treatment is an exciting new procedure that has been shortlisted for the prestigious 'My face, My body'award for the 'Most Innovative Aesthetic Treatment of 2016 and Revitalise Skincare Clinic are excited to be among one of a few introducing this revolutionary new treatment modality Plasma that enables us to offer 'soft surgery' other wise known as soft surgery. Plasma Surgical - non surgical treatments for eye rejuvenation (upper and lower blepharoplasty), crows feet, wrinkle reduction, skin tag removal and mole removal. Plasma Shower - active acne, pigment removal, skin regeneration and skin tightening. Plasma is an ionised gas with electrical energy which works throughout the surface of the skin to the epidermal layer. As the energy flows deeper within the skin, its intensity and effects start to change. Skin surface - kills germs and bacteria by breaking bacterial molecular structure. Epidermis - dramatically increases the skin absorption rate by temporarily breaking the cell adhesion molecules. Dermis - tightens aged skin and stimulates generation of collagen and fibroblasts. Non invasive eye contour surgery – improve eye-bags and eyelids with a result akin to surgery but involving NO surgical incisions. No scalpel, no general anaesthetic, no hospital stay. This treatment has revolutionised the way Aesthetic Physicians are able to rejuvenate the delicate eye area. Wrinkle treatment – non-ablative lifting and regeneration. Mole removal, milia removal, tattoo removal. Trouble-shooting acne cysts/spots, skin tags. Acne treatment – sterilisation of acne bacteria. Inducing absorption of serums or solutions, chosen to suit the patient’s skin needs. Skin regeneration – tightening the skin. Pigmentation treatment – promoting a clearer complexion, improving skin tone. The universe consists of 99.999% plasma. It is the fourth state of matter following solid, liquid and gas, whereby the gaseous state has been ionised by high temperature and high electricity. How does plasma work on the skin? Research conducted by Munich Unniversity has demonstrated that plasma is fatal to bacteria, yet provides beneficial stimulation to human cell and helps with regeneration. This makes plasma uniquely relevant for use in skin treatments. 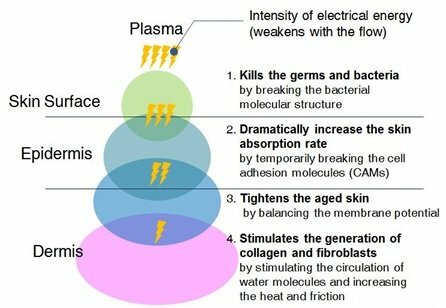 Plasma works on the skin at a number of levels as shown in this diagram. How do results compare to eyebag/eyelid surgery? Results are remarkable. See before after photos. How effective is it for treating acne? The treatment works by killing the bacteria that cause acne as well as promoting healthier skin and cell renewal. Results are not instant, as it takes time for the skin to heal. However, after 3 weeks, these photos show significant reduction in spots. The angry inflammation has gone and skin is much clearer. *Disclaimer* Results and patient experience may vary. These are dependant on a number of factors such as age, medical history and lifestyle. Feedback from our patient undergoing Plasma Shower treatment for Acne. "Hi Arvin, i went through my photos when i got home this afternoon and i was honestly quite shocked at the difference in my skin. I can obviously see it is a lot better but i did not realise just how much. Honestly i can not thank you enough. I never thought i would ever get my skin back to how it was"
After 2 Sessions of Plasma Shower. After 3 sessions of Plasma Shower. This is not normally an uncomfortable treatment, although it depends on the area being treated. If the Plasma Surgical is used for non-surgical eye lift, the delicate eye skin is more sensitive and treatment is more intense. In this case, a local anaesthetic cream is used so that treatment is painless. The Plasma Shower treatment is more diffuse and does not normally require local anaesthetic. An ice pack will be available if required to calm any swelling immediately after treatment. Will I need any time off to recover? Patients can usually return to work or normal activities immediately after treatment. Results are not instant, as it takes a little time for the skin’s renewal and healing processes to work. After acne treatment, the skin will start to look noticeably clearer and healthier within a few days, but it will take a few weeks for the skin to heal properly. After eye lift treatment, collagen building and skin tightening happens gradually over a period of around 6 weeks. After eye lift treatment, collagen building and skin tightening happens gradually over a period of around 6 weeks. Who carries out Plasma BT treatment? This is new technology which is not available in many clinics in the UK. This treatment should only be carried out by a certified Medical Professional. Arvin Banan (Medical Practitioner) is highly skilled in using Plasma treatments and the treatment is available at Revitalise Skin Care Clinic.